Sparkle kitties in action, caught on video! HARRISON is just under a year old, neutered, up to date on vaccines, combo tested negative, and microchipped. He is a super love bug, wants lots of affection, and will be a great couch potato buddy and snuggle partner! ​Harrison was rescued off a condemned property on January 29, 2017 after he and his kitty family and friends were abandoned by their owner. LIESL was rescued with her siblings Linus and Loralei. Her mama is a barn cat and since Liesl and her siblings were so young, they are easier to socialize and find them indoor homes. 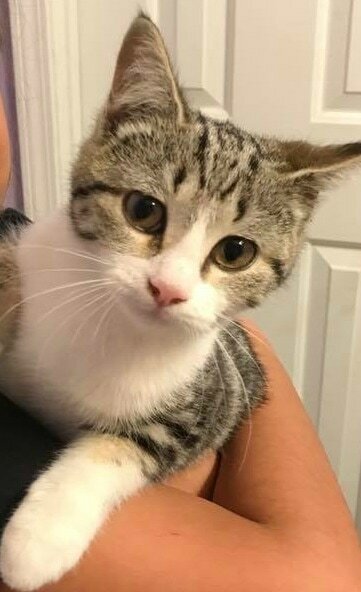 she is in foster care with Jenn & her daughter Alena, who is the kitty whisperer! Liesl and her brother Linus the day they joined Sparkle Cat Rescue and went to foster (2/11/17) Sister Loralei is in a foster home with another Sparkle kitty, Bond. RILEY was born around September 2016. He was rescued on February 13, 2017 from a condemned property where he and 14 other cats had been abandoned at the end of January. Riley wasn't spotted in our initial search and rescue for cats on the property and we received a message 2 weeks after his friends and family were rescued, saying they saw another cat on the property. Kristi and Stephanie climbed a locked gate, walked half a mile with two traps, a carrier, step ladder and supplies and ended up having to break into the property (with land owner's consent) in order to search for Riley. A trap was set inside the trailer and one underneath. Within an hour, Riley had gone in the trap, no doubt starving for the food in the trap after nearly 2 weeks without being fed by humans and no telling what he ate during those two weeks. He is so very grateful to be in foster care and you can tell from the video how much he loves humans. URSULA was rescued January 29, 2017 after being abandoned at a condemned property in Graham, NC. She and 14 other cats ended up being rescued at this property. They were left behind with no food or running water or plans for what would happen if they weren't rescued. Ursula has been spayed, up to date on vaccines, combo tested negative, microchipped. She is a cuddle bug and enjoys sleeping with her foster mom who is an Elon student.